What a whirlwind year 2004 was! 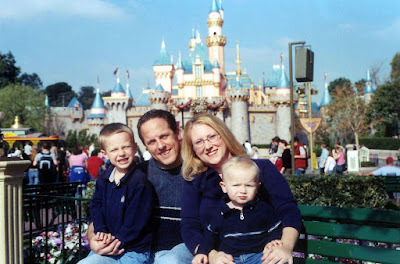 We wanted to take a photo at Disneyland, since Mike was back working for the Mouse and we were preparing to move to Hong Kong for a show going into Hong Kong Disneyland. We dragged Mike's sister Holly and her cool new digital camera with us, and took photos in various spots all day. This one was the most appropriate, in front of it's a small world, all decked out for Christmas. But when the cards arrived, we all looked a little blue! I complained to the company multiple times, but it was too late to order new cards. The slightly Smurfy-looking Chase family went out to all our friends and family. But we included a snap shot from in front of the Castle as well, where we looked a tad bit more pink!